We would like to take this opportunity to say hello and introduce our products and services to you. First, a little about us. 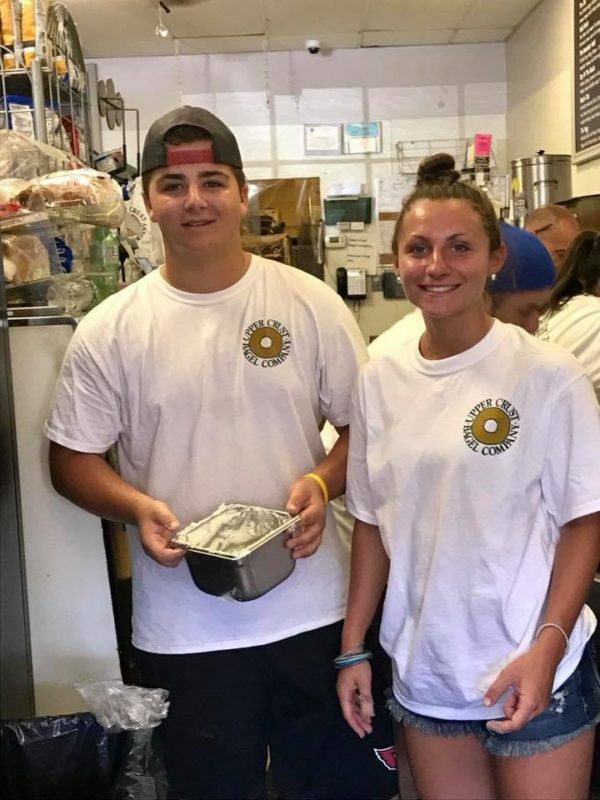 Upper Crust Bagel Company opened its first location in Old Greenwich, Connecticut in 1994. 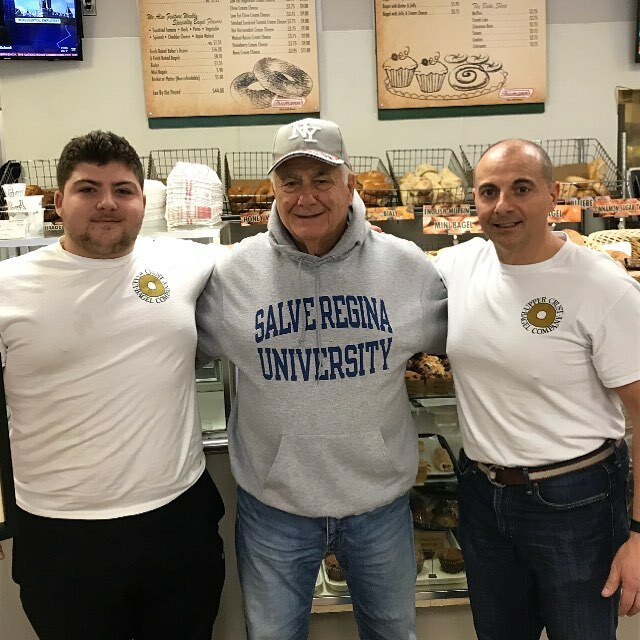 Robert & Amy Guerrieri, the owners of Upper Crust, are local residents who are committed to bringing the highest quality products and services to the communities they serve seven days a week. Now, a little about our products. 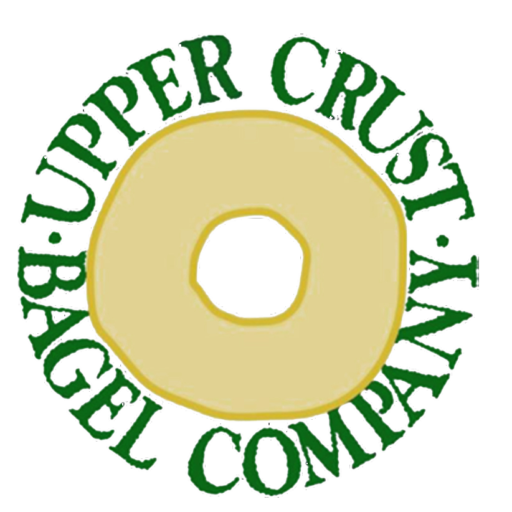 Upper Crust makes bagels from scratch using only the highest quality ingredients without additives or preservatives of any kind. Upper Crust does things the old fashioned way, kettle boiled and hearth baked bagels according to old world methods. Our bagels are BIG! – each bagel in excess of 5 ounces. This is known as a “Bull” style bagel. Upper Crust bakes over 18 different varieties. We top our fresh baked bagels with over a dozen different flavors of cream cheese spreads. You can wash down your bagel with our gourmet coffees, herb teas, chai teas, expressos, lattes, cappuccinos, vanilla cafe or whipped hot chocolate. If bagels are not what you fancy, choose from a huge selection of baked goods, fresh fruit platters, yogurt parfaits and more. Upper Crust offers a full line of top quality deli meats and cheeses. You can also top our sandwiches with our homemade salads, such as tuna, veggie tuna, chunky chicken salad, egg salad, white fish salad, cajun chicken salad, pesto chicken salad, curry chicken salad, hellfire chicken salad and low-fat salads also. Try one of our specialty sandwiches on a bagel or fresh hard rolls, tortilla wraps, white, wheat or rye bread. If you are not in the mood for a sandwich, we offer gourmet salads (whole or chopped): cobb, chef, California, tossed Greek and more. Satisfy your thrist from our selection of cold beverages. Call or fax us to order platters for your next business meeting or friendly gathering. We also offer online ordering through seamless.com, grubhub.com, ezcater.com, allmenus.com and menupages.com Our food is prepared and arranged by our skilled catering staff. If you are unsure of what to order, our friendly and knowledgeable catering staff would gladly offer their suggestions. Delivery services are free and convenient or you can pick up your order. As a convenience, corporate and house accounts can be opened with our billing department. We accept all major credit cards and checks. Eat in at our cozy family style picnic tables, pull up a stool and eat at our window counter or take out. Our moto is “Support the community that supports you”. We sponsor events, charity fundraisers, schools, religious, political, sports teams & programs, among many many others. We have been blessed to have customers that have span generations. Customers came as children and now grown up and taking their children to Upper Crust. We have built a great and safe environment to call your own. We are also honored to have been voted “Best Bagel Shop” in Fairfield County by Moffly Publications. Robert, Amy and the whole Upper Crust Bagel Family thank you for your patronage. Feedback, comments or suggestions are greatly appreciated.